French Emblems: Emblem: Sacerdos castus & animi liber. Sacerdos castus & animi liber. The priest is chaste and his soul is free. Quid fugitas hederam manibus contingere Flamen? Solidum quid annulum atque nodosum fugis? Sis liber animi, nec mali tibi conscius. Priestly one, why do you shy away from touching ivy with your hands? Why do you recoil from the solid and knotted ring? You priest, steer clear of Venus the ensnarer: Be free of spirit, and privy to no evil. Carmini Heroïco subiungitur Iambicum trimetrum. tera manu exhibeat annulum circularem & solidum. To a heroic hexameter verse is added an iambic trimeter. Among the early Romans we learn that ivy was held to have such religious potency for the Flamen Dialis that so much as to mention it by name - let alone to touch it - was considered an inexpiable sin. The reason being, that this plant overwhelms and entangles whatever it attaches itself to with a treacherous confusion of branches, as Pompeius Festus observes. 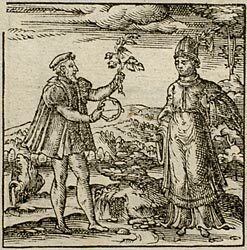 This symbol plainly shows that a priest should be chaste and as far removed as possible from all the wanton pleasures of Venus; for the gods of love entangle lovers and, having entangled them, torture them, just as ivy with its stranglehold will starve a strong tree of its life-sap. The same priest was not allowed to wear any unbroken or twisted ring on his fingers; so that he should be demonstrably free of any constriction on his soul, and without knowledge of any evil whatsoever within himself, who should be entirely devoted to matters of religion. The picture requires some non-priestly person to be depicted, offering ivy to a Flamen or sacrificus* (the Flamen was distinguished by a felt cap, on which rested an olive-twig with a twist of wool; the rest of his attire was rather similar to our own priests’, with a linen surplice worn over a robe, whence the name of the Linigeri); but the priest is refusing, and turning his steps away. Meanwhile in his other hand the first man is seen holding a round, unbroken ring. * i.e. priest. Sacrificus is an adjective (‘belonging to a sacrifice’) and not a noun in classical Latin; however there were priests with the title Rex Sacrificus and Rex Sacrificulus; sacrificulus (without ‘rex’) was used to mean ‘a priest’. 2. The chief priest of the cult of Jupiter. 3. For Festus, see emblem 25 ([FJUb025]).